Trace Race is a battle minigame in Mario Party 4. It returns in Mario Party: The Top 100. The camera zooms in on the beginning of a giant clipboard, as each player jumps in one by one, holding a giant crayon. 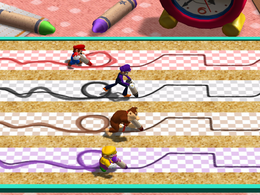 Players each have a giant crayon and a long path that they must trace. The path winds with a series of turns, curves and loops. Players score points based on their accuracy. The most accurate player at the path's end wins. 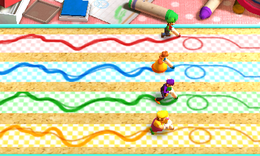 In Mario Party 4, each crayon and path is colored according to the character, with a relevant symbol at the beginning of the path. In The Top 100, the standard player colors are used, with the symbol aways being a mushroom. As soon as all four players reached the end of the track, the screen shows their traces from beginning to end, calculating who was most accurate. The winning player(s) will do their victory animation, while the other players do their losing animations. Rules – "Trace the colored line on the ground. Whoever stays closest to the original line wins!" Advice – "If no one scores more than 30 points, we'll call it a tie. Try to get 100, you guys!" Description – "Trace the guideline carefully with your crayon!" On-screen – "Trace the guideline carefully!" Everyone except Waluigi holds the crayon at a 45-degree angle. This page was last edited on August 4, 2018, at 07:07.